Over two hours devoted to the HiTorque 7x12 Mini Lathe. Jose Rodriguez takes you through setup, required accessories, and a whole set of basic demonstrations where he builds a mock saw blade arbor. A miriad of detailed demostrations are shown during the building of this sample project. 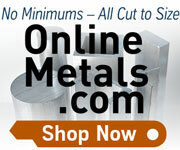 You will learn all you need to get started in the world of machine lathe work.